Endless landscapes, pristine coast and beautiful white sand beaches add to the experience, making the destination a photographer’s paradise. More hours of sunshine than the UK and blue skies leads to stunning clear nights, the perfect platform for marvelling at the southern hemisphere’s stars. There’s always something taking place – from amazing animal encounters to quirky events – to ensure an insightful slice of island life, whenever you choose to visit. 2012 will be a particularly eventful and poignant year as Islanders commemorate the conflict. June 14 sees the Liberation Day Parade each year. Islanders gather at the Liberation Monument and Christchurch Cathedral to mark the end of the conflict with a thanksgiving service, followed by a military parade around the capital, Stanley. Remembrance Day in November will be another significant date, drawing Servicemen past and present to the Islands’ shores. Expert local guides bring to life sites such as Goose Green and Tumbledown, setting the raw drama and personal sacrifice of the human conflict in one of the most peaceful places on Earth, as well as sharing personal memories. * Stanley – A number of memorials are placed in Stanley and the surrounding hills to commemorate the battles fought in 1982. Visitors can pay their respects at Stanley’s Liberation Memorial, built as a tribute to the British Forces and civilians who lost their lives during the conflict. 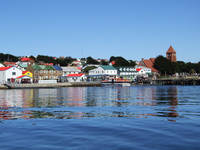 * Darwin and Goose Green – Darwin and Goose Green are situated on a narrow bridge of land linking upper and lower East Falklands with Lafonia to the south and Wickham Heights and the Onion Range to the North. Historic Darwin settlement retains much evidence of the 1982 conflict, including the Argentine Cemetery, situated 10 minutes drive from the settlement. Many headstones here commemorate, sadly, unknown soldiers. * San Carlos – A picturesque waterside settlement with the British cemetery and a museum covering the conflict and local way of life. * Pebble Island - Where the Pebble Raid occurred (May 15) and HMS Coventry was sunk by Argentine aircraft (May 25), and where wreckages and memorials can be seen. Today it is a beautiful island to stay and explore, home to more than 40 species of birdlife including imperial shag, waterfowl and penguins in abundance – gentoo, rockhopper, macaroni and Magellanic (it’s possible to see five species in a single day). * Liberty Lodge – British veterans who were part of Operation Corporate now have their very own house in Stanley. Overlooking the harbour and conveniently close to the town’s amenities, Liberty Lodge welcomes veterans at no cost. When not in use by war veterans, the Lodge is available for use by members of the Armed Forces serving in the South Atlantic. Tourists can fly to the Falklands on the MoD civilian charter flights from RAF Brize Norton, via Ascension Island, or on a weekly LAN Airways flight via Chile.